Do children still have to write essays about summer vacation when they return to school in the Fall? It occurs to me I wrote about some of our vacation when I posted about the time in the Dolomites (see Cooling off in the Alpe di Siusi and Good Morning Ortisei), but I never wrapped up with the fine time we had with our flock of visitors in Rome. 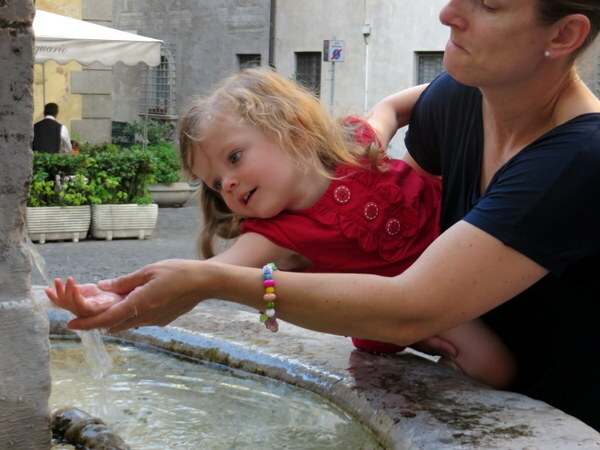 Elisabetta loved touching the water of the many fountains. Here Mamma Susan indulges. We were blessed with visits from the Seattle Bravenecs, also known as JSWE, for our time in the mountains and then 4 more days in Rome. We hit the Parco dei Mostri and Lago di Bracciano, entertained the kids while J&S went to the Vatican, shopped in Via Cola di Rienzo, celebrated Susan’s birthday at our favorite trattoria, and then welcomed the Omaha Bartons for their week in Italy. 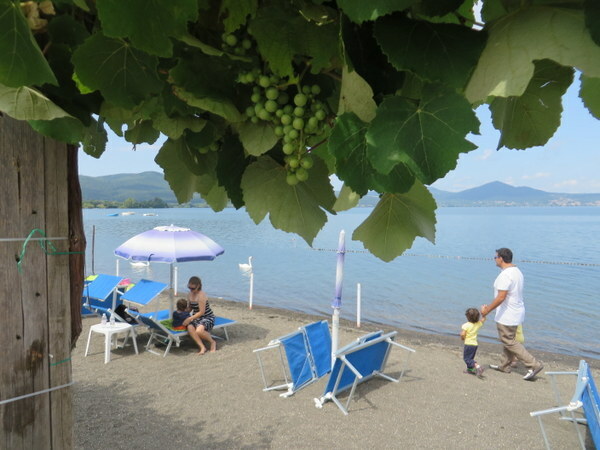 We were so lucky at Lago di Bracciano. Morning rain in Rome scared off the people who had reserved space on this beach, so we were able to claim some sand. Otherwise they would have been fully booked. It was 82 (F) and sunny for us. Perfect! We crammed all 10 of us in our little Roman apartment for a family dinner the night the Bartons arrived. It was fun to see everyone together: older cousins that had not seen each other in too many years (18? ), and younger cousins who had never met. When Susan and the littlest travelers headed off to Bratislava on the night train to Vienna our house felt ever-so-empty. Luckily Trevor, Andrea, Eli and Cade spent a few more days with us to ease the transition to dining alone with cats after they all left. We had looked forward to these visits for the better part of a year, but they were over too quickly! Thanks Bartons and Bravenecs, for coming to Italy. We were happy to spend Our Summer Vacation with all of you! Eli, Ric, me and Cade before gorging on pizza at Dar Poeta. Little Elisabetta enjoys a turn in the swings. A simple trip to the park is as much fun as anything else with the little ones. Ric pushes William higher and higher. Elisabetta enjoys relaxing in the shallows. William is not really chasing the swan…. It was clearly not afraid of him, though. Parco dei Mostri was a hit. Very strange place, but a good walk with kids and fanciful. to see just how big some of the sculptures are, note the tiny little person in the lower left corner. It’s unclear if the elephant is saving or killing the Roman soldier. Guess it depends on what the soldier did. Park of the Monsters indeed! WIlliam and the Cerberus. No-fear boy found Parco dei Mostri to his liking. you’ve been living in Rome. Do you eat the same things or very different things? Has your love or type of coffee changed? Hi Marcia! Sorry to be so long in replying, but we were in Switzerland, missing Italian food, wine and coffee! We eat less meat overall, but much of it pork. Not so much pasta (once a week maybe) but lots of legumes like cannellini beans, Borlotti beans, and the like. We love farro in soups, eat lots of roasted vegetables and overall more one dish dinners, no starch+meat+veg. We love our antipasti, from roasted peppers to hummus, salume and cheeses. Everything fresh fresh fresh! We also eat out: pizza every Friday, some type of Italian cuisine every Saturday, often fish, fresh anchovies if we can find them. Pizza is so different here that I wonder how we will adapt when we return to the States! If it’s not made in a wood-fired oven, it’s not real pizza. 🙂 We also eat a lot more nuts now, and fruit that is fresh and seasonal only. I must say I miss reasonably priced blueberries. They are worth a king’s ransom here. Ah, coffee! It must be espresso, occasionally a cappuccino. We have a home “Nespresso” machine that we are on love with. We feel deprived when we cannot have our 1 euro shots. In Switzerland the average price was 4 francs (about $4.50) for a cup of strong coffee. Madness! Love Cola di Rienzo. I used to buy all of my sweaters there as they were just the right weight for California winters. We hate to see our guests leave also; well, maybe not all of them. “Maybe not all of them…” Ha! It is tiring to have guests, though, wonderful as it is, isn’t it true? No doubt a very very good vacation for all. If your kitties are like mine, they are probably happy it is over!! They can be such tacky little critters, huh?! Yes the kitties are happy to have “normal” or what passes for normal. They were not happy when I went to Milano for two nights, and I expect they are pretty unhappy now as we are in Switzerland for 5 days. Poor babies! They’ll be cuddly when we get back! Dar Poeta … Gracia and I really enjoyed our pizza there with you and Ric. Hi Will! We remember it well, too! We go there about once a month. I cannot escape the lure of the salmon and Gorgonzola pizza with arugula! Un abbraccio!